I have been playing with felting more wool lately. I recently made a trip to some thrift stores and bought some old wool sweaters and blazers. The sweaters took about 3 good wash cycles in hot water to get them to fully felt and boy was that crazy. I will have to post more on that later and take before and after photos. It is a sight to behold a man's XXL 100% wool sweater becoming a child's size garment. Of course by the time it is that size it the wool is so thick and dense that a kid wouldn't be able to put his or her arms down! For the wool blazers I had to cut them apart first before felting. They too shrunk, but the effect wasn't as dramatic since they were just strips of fabric. One of the blazers (the red fabric in the photos) was already made of felted wool so I didn't run it through the washing machine. 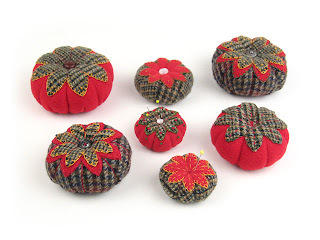 I used this felt to make pin cushions. I found the pattern on Etsy and decided to give it a try. I am not the best at sewing or decorative stitching, but I thought they turned out fairly well. The later ones definitely turned out better. 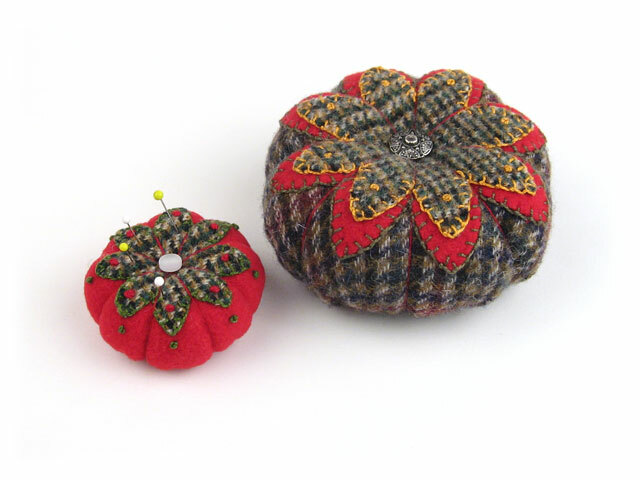 They range in size from 2.5" to 4.5" in diameter. I am excited to try some more. While I have plenty of the three fabrics left I really want to find some more colors. While searching for buttons at my grandmother's I found a few scraps of old wool. I am going to try to felt it (hopefully it isn't too moth eaten) and make a special one out of it including a button from her button box. That one will definitely be a keeper. The other ones I will probably give away as little favor/gifts. 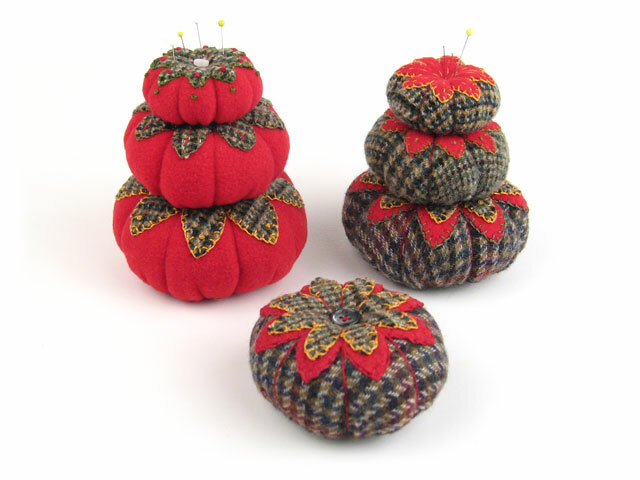 I mean, how many pin cushions does one person need? Of course how many baskets does one person need? But, that has stopped me from hording those! Thanks. I definitely got better at my decorative stitching. The first one's stitches aren't quite as consistent in size as I would have liked. The pattern called for a "button-hole stitch" instead of a "blanket stitch". I had not heard of it, but it was basically a blanket stitch with an extra wrap of the tread. Do you have the pattern from Etsy or a link to the shop/blog? Thanks so much! Dena, I just updated the blog with the Etsy store link (I should have done that initially). well, I would buy one of these. i love upcycling, particularly men's clothing, for some reason, and these are little fiber artist magnets, i think! Thanks, I have really enjoyed making these. I need to get busy and make some more. I keep buying more old blazers and felting them, so my fabric pile is growing!